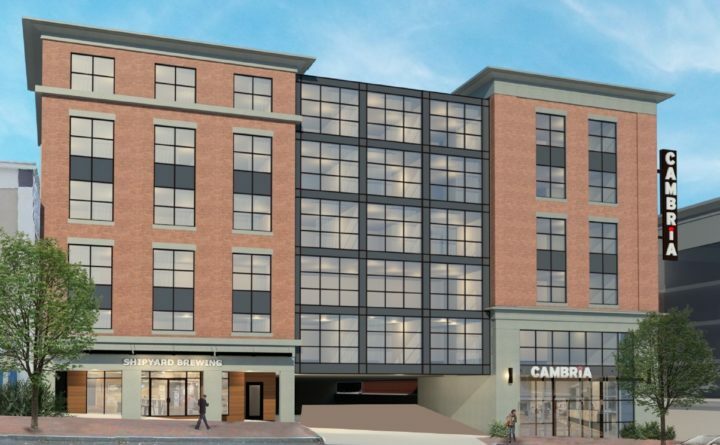 Just more than a week after developers announced a new Portland hotel would be affiliated with the Canopy by Hilton brand, Cambria Hotels said it will make its Maine debut with a hotel in the state’s largest city. The 102-room hotel at 86 Newbury St. is part of Shipyard Brewing’s $65 million so-called “brewtel” redevelopment project, where the company will also reportedly include offices, a tasting room and parking garage. Although Cambria Hotels only formally announced Thursday it has signed an agreement for the location, the affiliation is not a surprise: the brand name was featured on concept drawings of the brewtel released by Shipyard nearly a year ago. Despite the hotel development boom in Portland that continues, Cambria Vice President Mark Shalala noted in a statement that the city maintains “one of the top” revenue-per-available-room rates in the country, suggesting the local supply of hotel rooms hasn’t outpaced the demand yet.